Taking a leap toward the eventual reusability of SpaceX's Falcon 9 launcher, engineers have programmed the booster's first stage to make an experimental rocket-assisted splashdown in the Atlantic Ocean a few minutes after liftoff from Cape Canaveral on Friday afternoon. SpaceX is careful to describe the attempted first stage recovery as an "experiment," giving the chance of a fully intact retrieval at just 30 or 40 percent. "The entire recovery of the first stage is completely experimental," said Hans Koenigsmann, vice president of mission assurance at SpaceX. "It has nothing to with the primary mission." SpaceX ultimately hopes reusability will further reduce the cost of its Falcon 9 launches, which are already a fraction of the cost of many of it SpaceX's competitors. Liftoff from Cape Canaveral's Complex 40 launch pad is set for 3:25 p.m. EDT (1925 GMT). The mission will boost a Dragon supply ship into orbit with 2.4 tons of cargo and equipment heading for the International Space Station. But soon after the Falcon 9's first stage shuts down and separates from the launcher's upper stage -- a milestone expected to occur less than three minutes after liftoff -- the cylindrical 12-foot-diameter first stage will relight some of its engines for a braking maneuver. A few minutes later, the stage will ignite an engine again just above the water for a landing burn to set the rocket down into the sea at a slow velocity. The splashdown is expected a few hundred miles northeast of Cape Canaveral, roughly due east of the Georgia-South Carolina border. 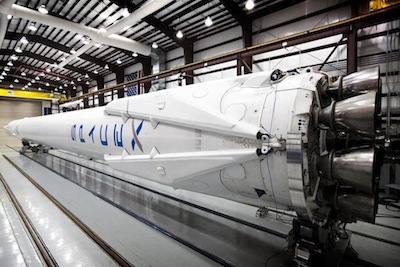 The rocket is fitted with four landing legs made of carbon fiber and aluminum honeycomb. The 25-foot-tall legs will extend down and outward, deploying during the first stage's descent. "We have a boat downrange, and we will perform an entry burn and a landing burn," Koenigsmann said, adding the test will pretend the Atlantic Ocean is actually a landing pad. Crews pluck the intact stage or fragments from the water and return them to SpaceX for analysis. Elon Musk, SpaceX's chairman and CEO, posted an update on Twitter on Friday, saying rough waves were preventing the recovery boat from reaching the expected first stage splashdown zone. The company hopes to achieve a controlled return of a Falcon 9 first stage to a precision landing in a touchdown zone near rocket's launch site before the end of 2014, but Koenigsmann admitted that is ambitious and will depend largely on how Monday's attempted water landing works out. "The important part is to collect data on these experiments and figure out if it worked well," Koenigsmann said. It won't be the first time SpaceX has tried to recover a Falcon 9 first stage. The first flight of the Falcon 9 in June 2010 featured parachutes to slow the first stage's fall into the ocean, but the vehicle did not survive the aerodynamic forces of re-entry. 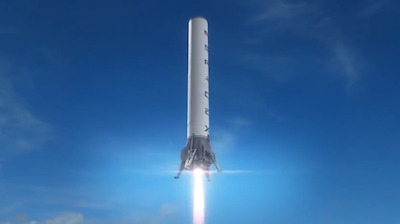 SpaceX unveiled a different approach to recovering the first stage for reuse in 2011. The Falcon 9's first stage engines would restart in flight and guide the rocket back to a landing zone somewhere near the launch pad, using landing legs to touch down vertically. 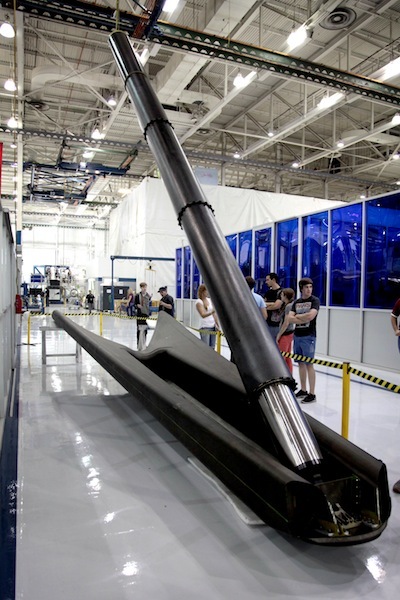 SpaceX has devised two prototype reusable launch vehicle testbeds for short hops at the company's Central Texas test facility. Higher-altitude tests will soon be flown from White Sands, N.M.
And the first mission of SpaceX's upgraded Falcon 9 v1.1 launcher from California in September tried a water recovery of the first stage. During the September launch, after shutting down its nine Merlin 1D engines and separating from the second stage, the first stage restarted three of its engines in a braking burn to reduce the rocket's velocity during the fall through the atmosphere. The stage's center engine ignited a few minutes later to further slow the rocket's speed just before splashing into the ocean, but the burn was cut short when the booster's spin starved the engine of fuel. SpaceX blamed centrifugal forces for keeping propellant out of pipes leading to the fuel-starved engine, causing it to switch off prematurely as the rocket hit the water and broke apart. "We do it step-by-step, so we'll look at the results of this one and will adjust the timeline and make modifications -- basically improvements," Koenigsmann said. "The overall goal is to get landing on land by end of this year, however, that's a challenge and if we pull this off we'll be super thrilled." Mike Suffredini, NASA's space station program manager, said the space agency agreed to SpaceX's placement of the landing legs on Monday's resupply launch after determining there would be "no appreciable impact" to the rocket's primary objective of deploying the Dragon supply ship bound for the space station. "The added mass is very small compared to the overall performance of the 1.1 version of the Falcon 9 vehicle," Suffredini said. According to Suffredini, NASA officials were diligent in making sure the legs could not prematurely deploy during ascent. SpaceX selected Monday's Dragon flight as the first mission with legs after skipping over two commercial satellite launches from Cape Canaveral in December and January. Officials said they committed all of the Falcon 9's lift capability to those missions, which carried communications satellites into geostationary transfer orbit for SES of Luxembourg and Thaicom, achieving the Falcon 9's first launches into a popular and lucrative commercial orbit. Koenigsmann said SpaceX did some limited experimentation with re-igniting the Falcon 9's first stage engines on one of the commercial launches, but the launcher did not carry enough propellant for a full first stage re-entry profile. None of SpaceX's competitors in the domestic and international launch market see the near-term technical feasibility or the economic potential of reusability promoted by SpaceX founder and chief executive Elon Musk. "There's no question it's nirvana," said Robert Cleave, president of Lockheed Martin's launch services unit, which sells the Atlas 5 rocket on the commercial marketplace. "It's been nirvana since the '60s. We've had some reusable things. The space shuttle was reusable, but the price point wasn't the best." Cleave said Lockheed Martin would never say no to rocket reusability. "There are material sciences [issues] involved, there are controls involved, and then simply there are performance efficiencies involved because when you reuse something you carry extra weight into orbit," Cleave said. "Are we there today? We need to do some more studying on the laws of physics to get there." "The reality is for the next 10 years, other than the Falcon, I don't think any of us are looking for reusability," said Phil Slack, president of International Launch Services, a Russian-owned, U.S.-based company which markets commercial launches on Russia's Proton rocket. "Things could change for the future, but as far as a Proton goes or on our next-generation Angara, those are expendable launch vehicles," Slack said. "At least in the near future, there are no plans to look at reusability." Stephane Israel, chairman and CEO of Arianespace, also said reusability was not on the French launch services company's horizon for next few decades. "There are some capabilities in Europe regarding reusability, so the technologies are existing, but it's a matter of fact that when you consider the roadmap of Ariane, we do not bet on reusability," Israel said. "We are looking at it, but it's not our primary bet that the business model is quite convincing. We will monitor closely what will happen."